Show the minimum required ships to take star from defending force. Show the minimum ships to defend against attacking force. Put a [MY_SYMBOL] button next to Attacker / Defender Weapons Technology. When clicked it should copy in your own level into the input. Consider including improvements from here. Maybe hide it under an ‘Advanced’ button. This also seems like a good idea. Add the calculator to the menu. 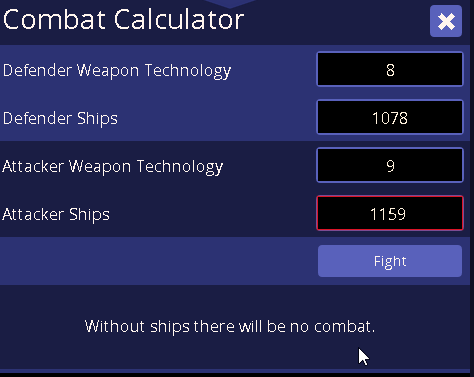 There’s been a few new players asking how to get the calculator since the button only exists on the fleet and star screens. Attacker ships is "1159 "